I apologize for my poor commenting habits recently. I am still reading everyone's posts but find myself too tired to comment :( Blah. I always knew how good a helper Kidlet was, but I never truly appreciated all of the things he did for himself and for me until he found himself unable! Now I am working for two! Phew! 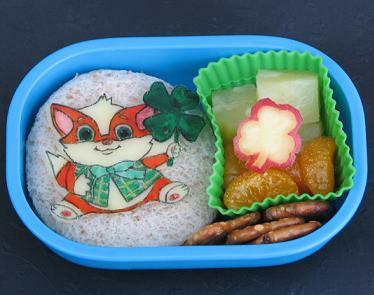 Omg, that apple clover is amazing! Don't know how you have such steady cutting skills with apple. Great job! And Jenn, I would like to pass you an award. Please pick it up here. Thanks! how cute! he is adorable! Can i have one hahaha. You are so good! Amazing detail with the food markers!